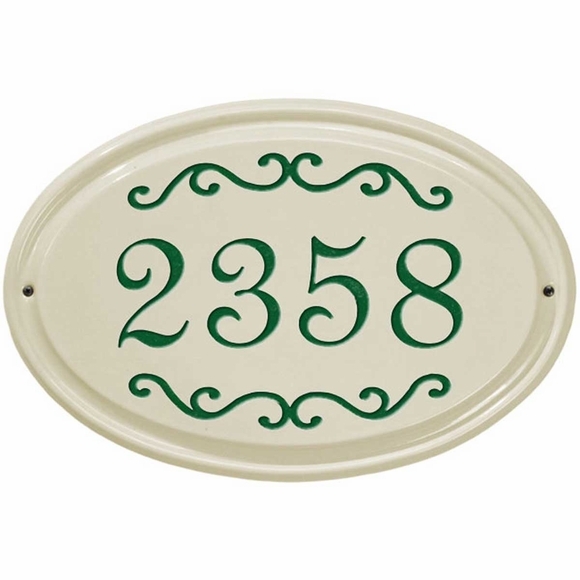 Personalized Ceramic Street Number Plaque - - oval wall plaque includes the house number you supply in large 3" numbers. High-fired vitrified ceramic withstands outdoor elements. Wall mount. Made in USA. This personalized plaque holds a one line address with up to five numbers. Design and number colors (from left to right in small images): dark blue, green, red, or black. Dimensions: 16.5" x 11" x .875". Similar ceramic plaques are shown in Related Products.